Bulgur has been a major staple in many rural areas in Turkey; during the Ottoman Period, the rice was a very precious commodity that only the rich could afford. This made the bulgur a very popular option and healthy one too. It is rich in fiber and provides good source of protein. Bulgur Pilavi is one of the many great varieties of pilaf and is a common favourite dish among the Turks (and my family too !). Its a very healthy and delicious treat for the kids. 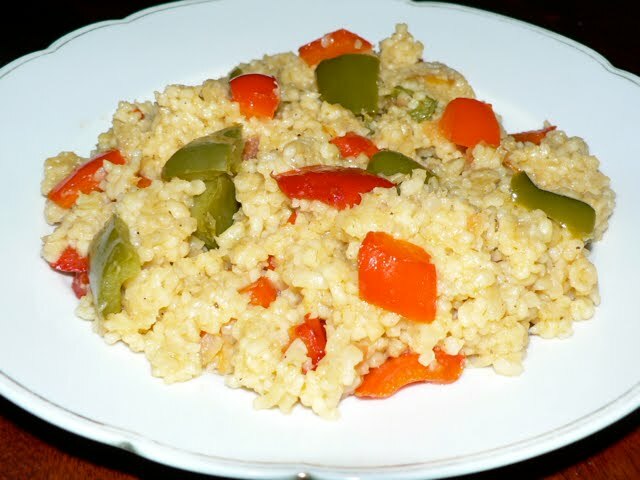 In making bulgur pilavi, red tomatoes, onions, green peppers, and other spices are usually added to the Bulgur and simmered in vegetable/chicken stock to make it wonderfully nutritious side dish. Salt - use less salt, as the vegetable stock already has in itself salt content ! 1. Soak the Tomatoes in hot water for about 15 minutes to remove their skin. The skin will peel off easily. Remove the seeds and cut each tomato into 6 parts. 2. Wash the bulgur and place it in a sieve for draining the water. Let it rest for few minutes in the sieve until all the water is gone. 3. Heat the vegetable stock. 4. Heat 40 gms of butter in a non-stick pan. Saute the onions for about 5 minutes. 5. Add the bulgur and the rest of the butter to the onions and cook for about 3-4 minutes. 6. Add the chopped bell peppers, tomatoes, salt and pepper to the bulgur and mix well. Cook for 3 minutes. 7. Add the stock and let it boil. Reduce the flame and then cook for another 10 minutes by stirring regularly to avoid the bottom of the pan from getting burnt. When all the water from the bulgur-stock is gone, stop stirring it ! 8. Remove the pan from the heat. Cover it with a Kitchen cloth and let it rest for 15 minutes. 9. Now mix and stirr the Bulgur Pilavi well and cover it again for 10 minutes before serving it. In Turkey, Bulgur pilav is usually served with any variety of meat dishes such as kofte (meat ball), kebap (kebab), Yogurt and any casserole dishes. It goes extremely well with Patlican Salatasi. 1. Use the olive oil (1/2 cup) alternative to butter if you are restricting your saturated fat intake. 2. This is a basic recipe, but feel free to add flavourings, such as thyme, bay leaves or pepper. Or add almonds or pine nuts to the bulgur for a more substantial dish. and to Iftar Moments by Taste of Pearl City. 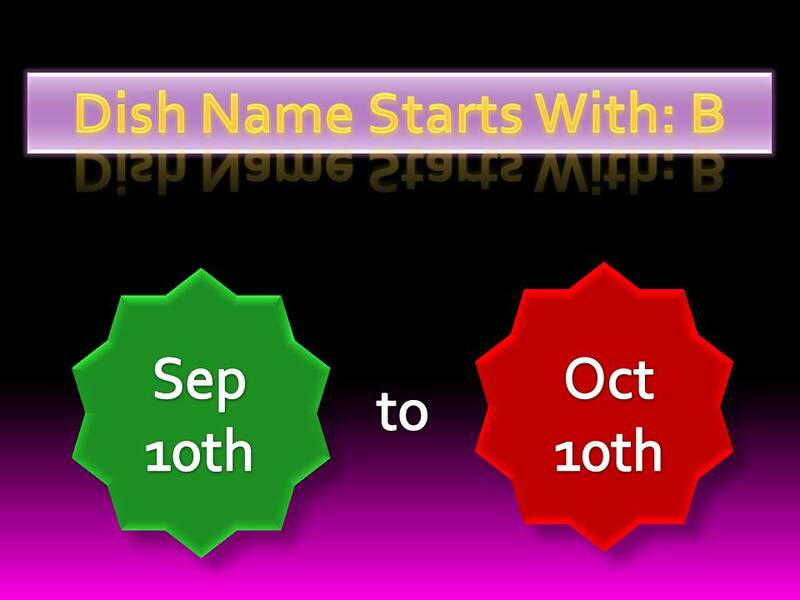 It also goes to the event Dish Name Starts With B by Akila. looks very colourful and yummy. when are going to post the kofte and kebap recipe??? Your baking skills are excellent dear.. which part of south india are u from..? i am from Kerala. Hi Asha, Suhaina and Akheela, Thank you so much for lovely words. Suhaina : Inshallah shall post the kebaps and kofte soon :) I was born and brought up in Chennai. New recipe for me..looks very colorful and yummy..thanks for sharing.